Procuring qualitative marketing database for your promotional campaigns is a tough job that Blue Mail Media can simplify for you. If you are looking to run targeted marketing campaigns in Missouri, our Missouri Business Email List will give you enough opportunities to connect with key decision makers, C-Level Executives, and professionals across wide ranging industries. Since inception, Blue Mail Media has emerged as one of the most reliable marketing data solutions providers in the US. We believe that each business has a unique set of priorities and challenges and a ‘one size fits all approach’ may not be suitable in serving them. 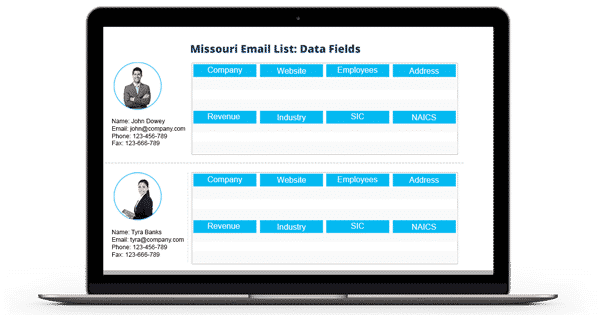 That is why we offer our clients customized Missouri Business Executives Email List that perfectly aligns with their campaign specific requirements. Our clients can get their list customized based on SIC/ NAICS code, job role, scale of operations, staff Size, among many other selects. Our Missouri Business Email Database offers you a competitive edge in terms of expanding your business in Missouri.